It is our hope that after your first visit (and every visit), you will feel truly blessed to have been in the house of the Lord. Most of us have been visitors at one time or another, so we can relate to what you might be feeling and the questions you might have. On this page we’ve tried to answer some of your questions even before you arrive. It is our hope that after your first visit (and every visit), you will feel truly blessed to have been in the house of the Lord. 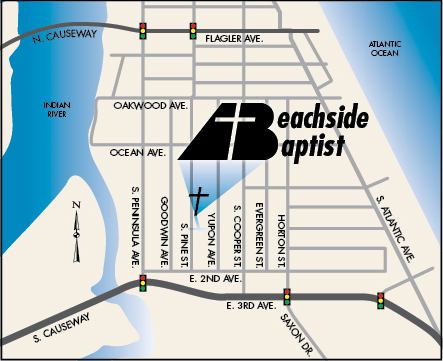 Where is Beachside Baptist Church? We are beachside in New Smyrna Beach, Florida at 629 S. Pine Street, New Smyrna Beach, FL 32169. That means we are on the east side of the Intracoastal waterway (over the bridge). We are fairly easy to get to. See our Google location map on our contact page. Once you arrive, please note that visitor parking is designated by guest parking signs close to the church building. Depending upon what service you are attending, our signage will help guide you where to go. Sunday services are held in the Worship Center. The nursery and bathrooms are down a short hallway, marked with a sign on the west wall of our building. To locate a Sunday school group appropriate for your age, ask a Greeter, or stop in the Fellowship Hall. We’ll be happy to introduce you to a class. Our Fellowship Hall is a great place to grab a cup of coffee (sometimes a donut or other snack), meet a few members and possibly join other visitors. It is also where Wednesday evening prayer and Bible study is held. We are a smaller congregation, yet growing because of the love we have for one another and our community. The Lord is working in our presence! The sermon comes from God through His word within the Bible and songs are sang from a hymnal. Some may consider our services a little “old-fashioned,” yet many of our visitors and new members are comforted by a traditional service. Sure, we have fun. We’re not boring! We laugh, we clap, we rejoice. We invite visitors of all ages to join in. What Can I Expect From the Members? We want your visit at Beachside Baptist Church to be a relaxing and enjoyable experience. Our congregation is very loving and friendly, so don’t be surprised when you are approached by our members to visit before or after the service. We’d love to get to know you better. We will not make you stand up and announce yourself. We will not invade your private life (home visit, phone call or E-mail) without an invitation or your permission. We do ask that you fill out a visitor card. These are located in the pew back, or a tear off portion of the bulletin. If you’d rather provide this information later, a return mailer can be provided with the gift bag given to first-time visitors. Nothing! We are just thrilled that you have chosen our church to visit. We are informal. You don’t have to dress up. You’re at the beach after all. Our services start on time and usually run one hour in length. You can be on your way to the beach before noon on Sundays! Of course we’d love for you to worship with us on a regular basis, however, we know that some visitors are here on vacation, others are in town for the winter or a short time (also known as snowbirds); still others have recently relocated to New Smyrna Beach and are researching where they might best fit in. Maybe you’re a long-time resident of NSB and want to see what we’re all about. We want to serve your needs with the time we have with you. Please do not hesitate to let us know what those needs might be! If you are a returning visitor, seeking church membership, or have questions, contact us or check out the many opportunities offered to get more involved. It is a blessing to have you! Children have their own church service which begins after the special music, just prior to the sermon during the regular worship service. Children leave the sanctuary and are led by one of our qualified leaders to their classroom upstairs (or in the Fellowship Hall). Our children’s department is headed by loving, qualified teachers and workers. Your child is in great hands and will have a fun time learning about Jesus! Read more about our children’s department and programs. For children 3 and under, our nursery is staffed and available during Sunday School and during the morning worship service. It is also available on Wednesday evening during prayer and Bible study. Take advantage of some “me & Jesus” time and relax knowing your child is in good hands. Your baby is a gift from God, and we’d love to share in the responsibility of caring for your child while you are attending services. For more information about our caregivers, please see the children’s section of our site. If you have any unanswered questions, please fill out the form on our contact page. We want you to enjoy your visit. If there is anything we can do to help make your time in God’s house more relaxing and special, let us know. Thanks for visiting!